Southern comfort and amazing views await you in this two bedroom villa. 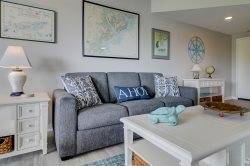 Directly overlooking Shelter Cove Marina, this tastefully decorated villa is the perfect spot to enjoy everything the harbor has to offer! Watch the kayakers, boaters and water enthusiasts from your deck or just lounge on the sofa and enjoy the view! Stroll the Shelter Cove Boardwalk and enjoy countless water sports, music, shopping and dining right outside your door. Enjoyed our stay. The condo is beautiful and everyone was super helpful. This condo is beautiful. We are very familiar with this complex but never rented before. Everything was perfect. We had an issue our first day with the garbage disposal so I called the service and someone was in the condo to fix it in less then 20 mins. I couldnt have picked a better condo or company to rent from. Thank you! Thank you for making this vacation so wonderful! We can't wait til next year! We'll be calling you soon to book! Great location at Shelter Cove Marina with nice view of marina & boats.